He's Everywhere And Nowhere! A quiet country village, a heavy snowstorm, a mysterious stranger. . . more than enough to rouse the townspeople to gossip and speculation. Who can he be, this suspicious-looking man who keeps his face hidden and his back to everyone? But when the stranger finally faces them, there are more questions than answers, and more terror of the most unspeakable kind, as outrage and murder put the once quiet countryside into the grip of an unstoppable madman. 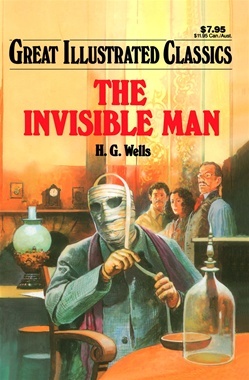 Ultimately it is up to one man to solve the mystery and end the rampage, to reveal the identity of the faceless Invisible Man!